Taking Care of You: What's In Your Cup? Just as there are "cat people" and there are "dog people", I believe the same distinction exists between drinking coffee or tea. You may drink them both but one or the other is your true drink of choice. I am a coffee-drinker, though not a coffee-aholic. In the dark morning hours, I enjoy wrapping my hands around a steaming mug as I inhale the delicious fragrance of the steam. I sip the drink slowly as I work at the computer, enjoying the silence and solitude of the this time of day. Until the kids wake up or it's time to get us up and moving out the door, this is my time. For a few weeks last year, I tried to be more healthy and become a green tea drinker. Since my taste buds would not go for anything but coffee in the morning, I drank only a glass of water in the morning and a cup of hot tea sometime during the day in lieu of my regular glass of water. (A bit off topic but to explain, from 11 a.m. - 4:00 p.m., I drink 8 oz. of water at the top of each hour while at work.) Though I was happy for the healthier switch, I still missed the chocolate part of my hot drink routine. So, I returned to my warm cuppa love in the morning. After reading Jo-Lynne's post over at Musings of a Housewife, I am thinking of attempting another "healthier switch"...this time to Choffy. 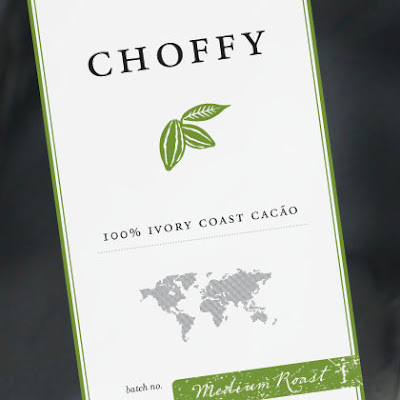 Choffy is made from 100% organic cacão beans (also known as cocoa beans), roasted to perfection. All the antioxidant value, mineral benefits, neurotransmitter rejuvenating properties and overall health-giving qualities are found naturally in cacão beans. No sugar, no dairy, no chemicals. Just one ingredient: cacão. The most favorite part of my warm cuppa love routine is the chocolate I put into the mug. And now I find out that they've actually brewed that chocolatey love and I can have an entire cup of it...Where can I get some of that?! I emailed Melisa Mons (Jo-Lynne's source) to request a sample and I didn't have to wait long to hear from her. Within a few minutes, she had replied and my sample was scheduled for delivery. A sample bag of Choffy is $3 (shipping included!) Melisa would love to get the word out about Choffy, so she offered the sample for FREE if I shared my thoughts on it somewhere, such as the blog, Facebook, Twitter, etc. Of course I would be glad to tell the world about brewed chocolate, thankyouverymuch! Now, Choffy is 100% organic cacão beans, so if you don't enjoy the taste of dark chocolate you might need to enhance your drink with some sweetness! After trying it straight, I decided that just like regular coffee I needed to add some creamy sweetness to my drink. The best part is that with the health benefits of cacão in my warm drink, and not caffeine, I did feel like this was a healthier drink overall. If you're looking to enjoy a warm cup of something delicious, I would highly recommend trying Choffy for yourself! Jo-Lynne also mentioned the amazing truffles she tried from Choffy...which are organic, vegan, dairy-free and gluten-free. She is going to give them as teacher gifts and said that they'd make a fabulous Valentine's gift as well. As for me, I've been nibbling on a few grounds left in the sample bag. So incredibly good! I can imagine sprinkling them anywhere I'd like a touch of dark chocolate.